Venezuela came to a standstill on Tuesday as the country tried to deal with its newly introduced currency. Thousands of businesses closed in order to adapt to the "sovereign bolivar", and many workers stayed at home. The government says this will tackle runaway inflation, but critics say it could make the crisis worse. The notes went into circulation on Tuesday. President Nicolás Maduro has said the measure will be the saviour of the economy and tackle the spiralling hyper-inflation. 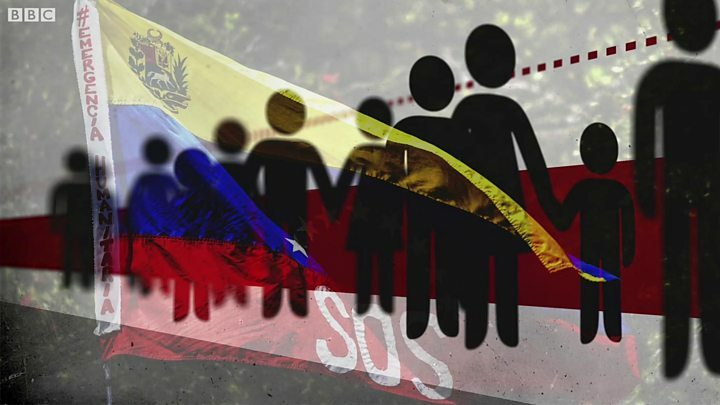 Ordinary people however, simply don't believe him and are concerned for the future, putting even greater pressure on neighbouring countries struggling to deal with the exodus of millions of Venezuelans. The new currency lops five zeroes off the old "strong bolivar" - meaning a cup of coffee worth 2.5m strong bolivars in the capital Caracas last month now costs 25 sovereign bolivars. Separately on Tuesday, Venezuela was shaken by a powerful earthquake along its northern coastal region that was felt in Caracas, where many of the city's buildings were evacuated. US seismologists reported a magnitude 7 quake with an epicentre in the east of Venezuela, while the Venezuelan authorities recorded a magnitude 6.3 quake. Eyewitnesses in the coastal town of Cumana described residents rushing into the streets, according to Reuters news agency. No casualties were reported. Earlier, cities across Venezuela were virtually deserted as people struggled to get hold of the country's new banknotes. Venezuela's black market in dollars was even frozen by the currency shift amid confusion and economic uncertainty. President Maduro also said the sovereign bolivar would be tied to the petro, a virtual currency the government says is linked to Venezuela's oil reserves. But the US has banned its citizens from trading in it, and one cryptocurrency site, ICOindex.com, has even labelled the petro "a scam". "Anchoring the bolivar to the petro is anchoring it to nothing," economist Luis Vicente León told AFP news agency.